The Three-Story Hamster & Gerbil Cage is a spacious home for your hamster or gerbil. The included ladders, platforms and house provide space to play and hide while satisfying your pets natural instincts to be above ground level. Also included is an exercise wheel to keep your hamster or gerbil entertained and maintain necessary activity levels. 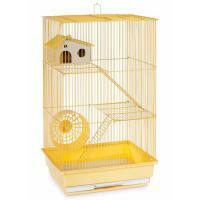 Owner friendly features include a top-opening door, allowing you to access all levels of this three-story hamster cage, plus a removable bottom grille and pull-out tray for convenient cleaning. Available in Light Blue, Mint Green, Lilac or Yellow our Three-Story Hamster & Gerbil Cage measures 14 1/2" Long, 11 1/4" Wide, 22" High with 5/16" wire spacing. "I could not get better care if I was family!"